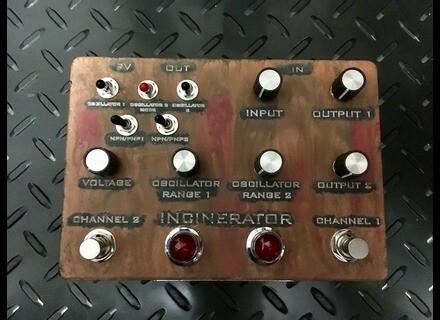 Incinerator, Fuzz pedal from Industrialectric. Accompanying this review are two videos that demonstrate many of the sounds/tones achievable with the Incinerator, but there are a few things I want to cover that I did not demonstrate in the videos. First, the Incinerator is one of the best pedals I’ve heard that sounds great as you dial back a guitar’s volume. With volume up full the fuzz sounds more saturated and thick, but as you dial back the volume it takes on a more ‘distorted’ and edgy sound than strictly as a fuzz. This makes it very useful when combined with a higher-gain amp channel (with gain relatively low at about 20-25%) – with your guitar up full you get a massively thick and heavy fuzz, but with the guitar’s volume dialed back you get an incredibly warm, sweet, organic-sounding and harmonically-rich tone that is simply fantastic for leads and melodic playing. I literally prefer this (e.g., Incinerator fuzz with guitar volume dialed back) over the higher-gain tone of my amps and pre-amps. When you listen to the two videos you will hear the Fuzz on both Channels of the Incinerator to the extreme (and the guitar’s volume up full), along with various oscillations to add some chaos that is nothing short of a slap in the face. Many fuzz pedals have some type of bias control (for that breaking up sound) and some do have oscillators. But the Incinerator’s sound is very different – it sounds alive and very electrical. Even if you rarely use the oscillators, the 26 silicon transistors and various stage switches produce several different fuzz qualities and tones. Roll off your guitar’s volume and you suddenly produce even more variations of fuzz. Fantastic! You also can ease off on the power of the fuzz on Channel 1, but adjusting the Input knob (which only affects Channel 1), just in case you don’t want to go full bore. The Incinerator was developed by Industrialectric in Toronto, Canada (and produced one at a time by hand); it is about as boutique as it gets, with its rust finished chassis (also available in black) and large jeweled LEDs – a look that resembles something that came out of Chernobyl. Intimidating at first, it doesn’t take long to zero in on some killer fuzz tones, with or without oscillation. Besides looking super cool, there is so much to like about the Incinerator. First, the massive number of transistors allows for various combinations of fuzz tones, from smooth to chainsaw ripping. Second, there are two channels, which can operate individually or together – and each of these has separate oscillators (Channel 2 has an additional oscillating switch to allow for even more fuzzy weirdness). Third, each Channel has its own Output, which means you can use one channel for some crunchy rhythms while using another channel for some smooth leads – and all the while control the volume of each, viz., you can boost one channel more than the other. And if you decide to combine the two channels, you still can control how much you hear of Channel 1 vs. Channel 2 (and only one channel may have oscillation). 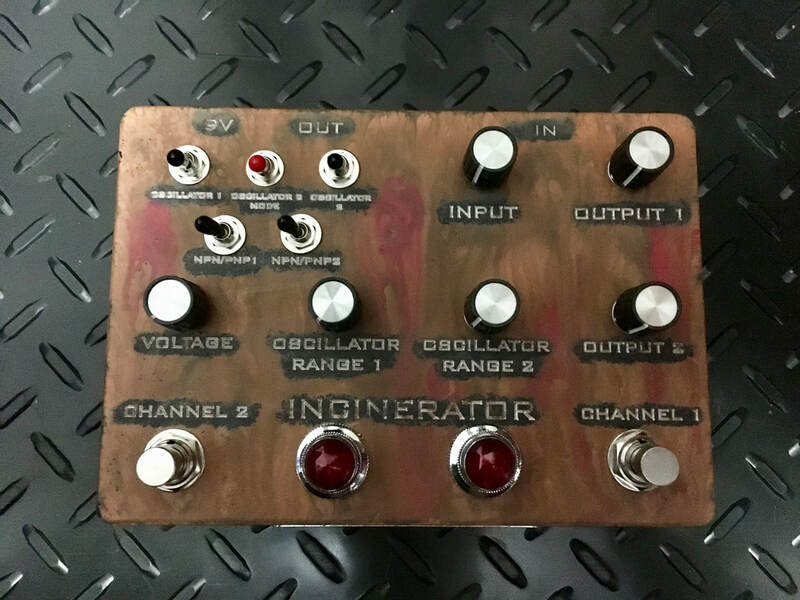 There are so many tonal possibilities, and the Incinerator works great with clean or overdriven amps. In fact, all you need to do is place the gain about quarter way on a high-gain channel, engage the Incinerator, and you will unleash a massive beast. Because the Incinerator offers so many features and possible settings, it’s certainly not a plug-and-play device. 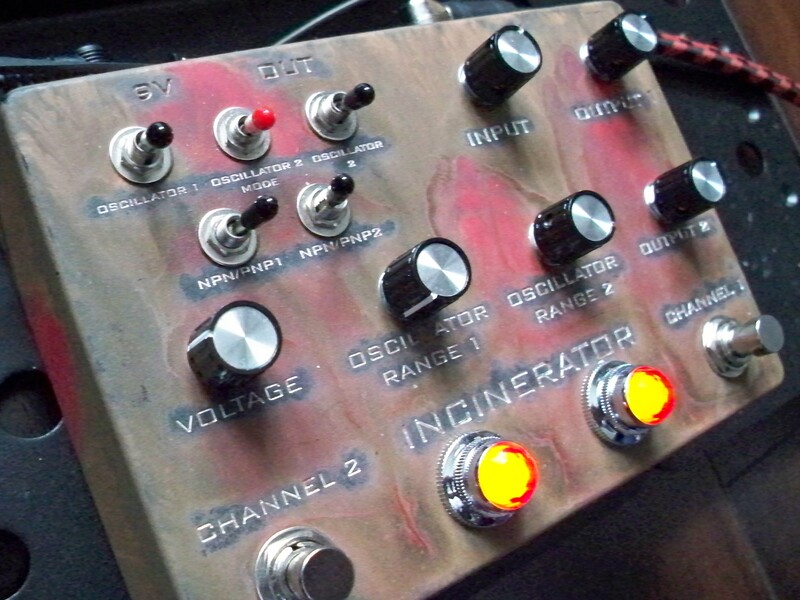 The Incinerator can be very simple to use if you keep going back to the same fuzz tone and use only one Channel. However, for those looking for a wide array of fuzz possibilities, you’ve just walked into a candy store. Starting with Channel 1, you can adjust the Input and Output of the fuzz. The Voltage knob, in simple terms, can make your fuzz sound smoother and more saturated, or broken up and bubbly (both the Input and Voltage affect only Channel 1). There are two npn/pnp toggle switches, which are transistor switches; they allow you to choose between different variations of transistor stages (in essence, you can hear either a brighter vs. deeper and darker fuzz). The Oscillator switch for Channel 1 engages that weird feedback signal, mixed with the fuzz. If you turn the Oscillator knob all the way clockwise or counter-clockwise it will not be engaged – you have to tweak it a little bit in either direction. There is a higher oscillating frequency when turned toward the left, whereas the tone is deeper when turned toward the right. Channel 2 has similar options, although, as stated, the Input and Voltage only affect Channel 1. The two npn/pnp toggle switches also work with Channel 2, but there is an additional (red) toggle switch that flips between two modes of oscillation, to expand your sound possibilities. And if you want to go all out, you can merge Channels 1 & 2 into one freaky and chaotic fuzz tone (I didn’t demo adding in oscillation when doing this, but with the various oscillations and Output levels for both Channels you get a ton of experimental sound options and possibilities). An over-sized pedal (17mm x 12mm or 6.75 x 4.75 inches), the Incinerator is very light-weight, which suggests its chassis is made of Aluminum. It looks heavy, likely due to its rusted metal paintjob, which has an excellent finish and quality and is not actually rust (your hands or equipment will not dirty). The footswitches for Channels 1 and 2 have a smooth springiness that clicks nicely. The large jewel LEDs are of high quality and reminiscent of those found on Fender amps – they look awesome when lit. The knobs are of high quality and the pots very solid and of high quality when turned. The most fragile part of the Incinerator is the toggle switches, associated with fuzz type and oscillation, all of which are far removed from the foot switches. The toggles are of good quality, as well, producing a solid click when moved side-to-side or up-and-down. All inputs (guitar in, guitar out and power) are located in the back and away from stomping feet. Lastly, the Incinerator has reverse polarity circuit protection, to further support the high standards of Industrialectric.